Prototype: Class 01.5 steam express locomotive with an oil tender for oil firing. GDR German State Railroad (DR/GDR) "Reko" version. Includes spoked wheels, type 2´2´T34 (Oil) standard design tender, special design Witte smoke deflectors for the class 01.5, continuous dome streamlining, no inductive magnet, and decorative striping. Road number 01 0505-6. The locomotive looks as it did around 1975/76. 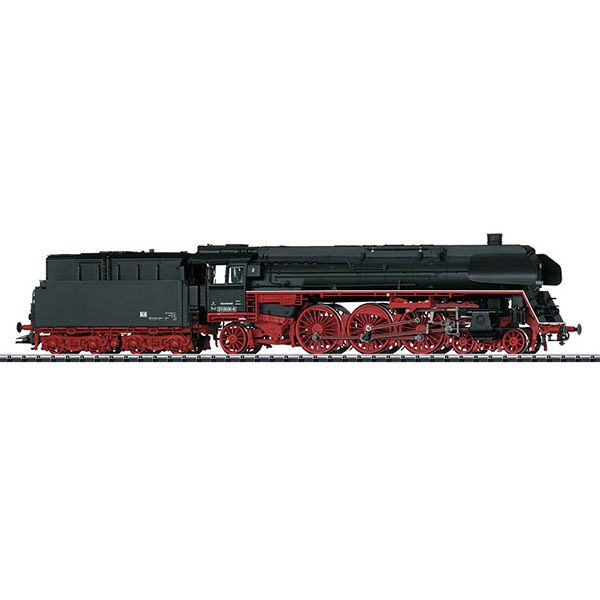 Model: The locomotive has a digital decoder and extensive sound functions. It also has controlled high-efficiency propulsion with a flywheel, mounted in the boiler. 3 axles powered. Traction tires. The locomotive and tender are constructed mostly of metal. The 7226 smoke unit can be installed in the locomotive. The triple headlights change over with the direction of travel. They and the smoke unit that can be installed in the locomotive will work in conventional operation and can be controlled digitally. The cab lights can also be controlled digitally. Maintenance-free warm white LEDs are used for the lighting. There is a close coupling with a guide mechanism between the locomotive and tender. There is a close coupler with an NEM pocket on the tender. The minimum radius for operation is 360 mm / 14-3/16". Protective sleeves for the piston rods and brake hoses are included as detail parts. Length over the buffers 28.2 cm / 11-1/8". Highlights: Completely new tooling. Especially finely detailed metal construction. Decorative striping on the buffer supports and running boards. Continuous dome streamlining. Partially open bar frame and many separately applied details. Digital decoder and extensive operational and sound functions included. The class 01.5 steam express locomotive is being issued in a one-time series for the 25th anniversary of the reunification of Germany. The Interzone express train passenger car set to go with the class 01.5 steam locomotive can be found in the Marklin HO assortment under item number 42912. This model can be found in an AC version in the Marklin HO assortment under item number 39206.